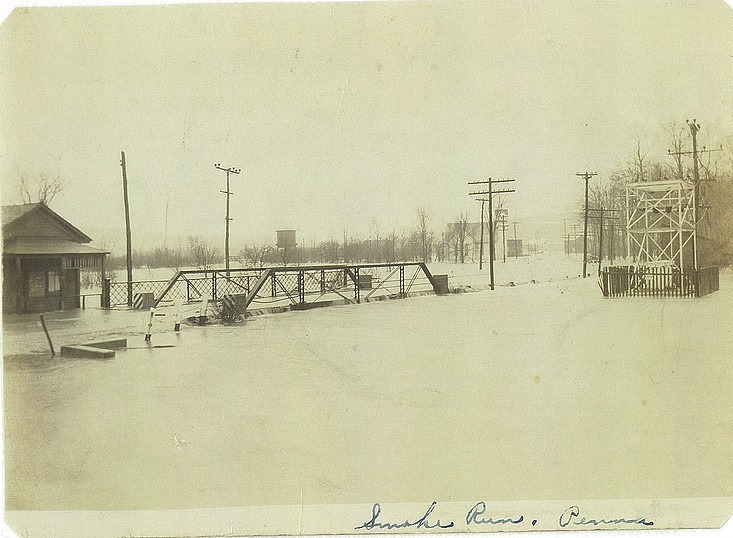 The devastating St. Patrick’s Day flood in March of 1936 was a result of a perfect storm of combined flooding conditions that ravaged much of Pennsylvania. A deep snow accumulation combined with rising temperatures and rapid snow melting turned streams and rivers, throughout the commonwealth, into something resembling overflowing lakes. Clearfield County was not spared the deluge. There was, then, no Curwensville Dam to protect Clearfield and areas down river. Clearfield itself was inundated. Smaller steams, such as Muddy Run in Smoke Run, in Bigler Township, rose to flood all surrounding low-lying areas. The photo shows the flooding that isolated the Methodist Church there. The building was scarcely used for a number of years and was demolished three years ago. Today, the bridge shown is a modern replacement and the railroad water tank, used for replacing water in steam locomotives, is long gone. The four flat-topped pyramid shaped concrete bases, which once held the steel scaffolds and the tank itself, still survive. The Houtzdale to Smoke Run Rails to Trails has taken the place of the long-removed railroad tracks.